From our production facility to the tables of our restaurants, our pasta is made every day fresh and expressly cooked to enjoy the best Italian food experience. We mix flour, water and eggs with our passion for food that comes intact from our deepest Italian origins. In 2007 a group of friends and entrepreneurs from Italy decided to move to South Florida with their families with the dream to bring to neighbors and friends the taste of the real Italian fresh pasta. They bought a factory space in Fort Lauderdale area, imported original fresh pasta machines from Italy and began producing fresh pasta, fillers and sauces according to ancient Italian recipes. Their fresh pasta began to be well appreciated from various clients, restaurants, cruise lines etc… but their original dream became true when in 2009 they opened the first Spaghetto Restaurant in South Beach, a small kitchen place where anybody could taste the daily produced artisan fresh pasta cooked at perfection following the best Italian traditions and served in a friendly environment at the right price! With the time the menu got wider and today Spaghetto restaurants offer also other traditional Italian dishes always with the goal to follow the rich Italian culinary traditions. Led by true Italians, first generation Italian chefs and entrepreneurs, who came to the United States with the dream of sharing our recipes. We are a marriage of the old world Italian pasta with the new world technology to produce the finest fresh pasta that our mothers would be proud of. Using traditional Italian recipes, we create 100% natural, no preservatives added, fresh pasta specialties. All our pastas are non-pasteurized, the key to its freshness, homemade taste and unmistakable texture. We daily produce fresh artisan pasta in our factory and express cook it in our restaurant to let our customer enjoy the best Italian food experience. The history of Italian Cuisine does not need many introductions. We want this strand: offer you the True Taste of Italy at the right price. At Spaghetto Factory, our passion is fresh, wholesome, great tasting food. As an Italian owned business, we take pride in servicing our customers with fresh ingredients and the same homemade taste we’ve enjoyed with our families. Our method always keeps quality, freshness and an authentic Italian taste at the center of all we do. Now, our authentic Italian taste and quality ingredients will help you create complete meals for you and your family effortlessly, straight from your freezer, while never compromising the same fresh taste you know from Spaghetto. We are a marriage of old world Italian pastas with new world technology. We produce the finest of pastas that our mother would be proud of. Old world gourmet recipes that your business could call their own produced in one of the highest scoring USDA and FDA inspected and approved facilities. We are led by true Italians, first generation Italian Chefs and entrepreneurs who came to the United States with the dream of sharing our recipes with our neighbors. Using traditional Italian recipes, we create 100% natural, no preservatives added, fresh pasta specialties. 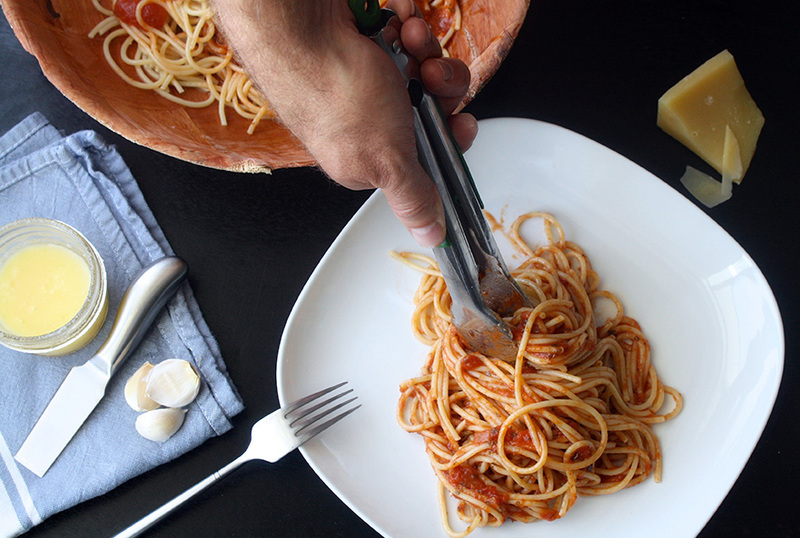 All of our pasta is non-pasteurized, the key to its fresh, homemade taste and texture. We also follow a different approach to the business. Compared to huge multinational corporations that produce one canned pasta fits all we look forward to working with our customers sitting down and sharing our recipes. As you would in the old country, come to our kitchen sit down and let us develop custom recipes and pastas for your needs. Remember if we help you succeed the most obvious outcome is that we will succeed. Italy has always been seen as the cradle of the kitchen with all its traditions and the homemade pasta is the prerogative of the Italian culinary culture. 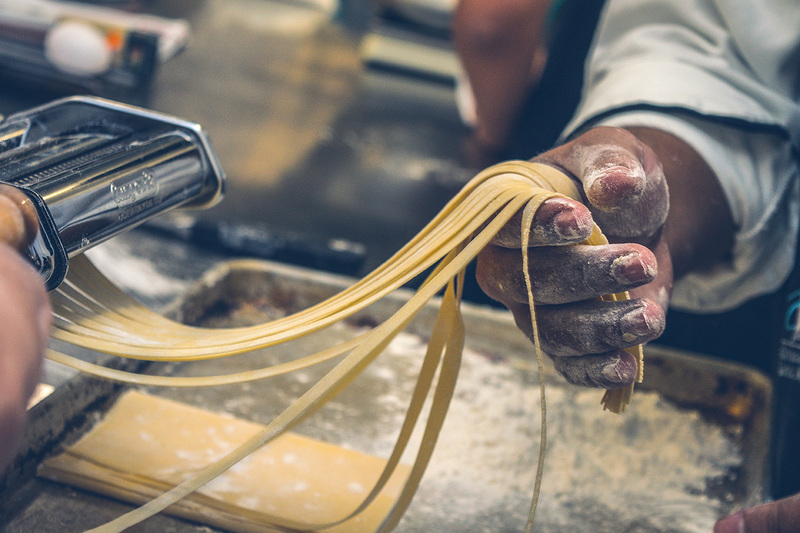 Our desire at Spaghetto is to convey the pleasure of these traditions intact, from our local production of fresh pasta and sauces, to the kitchen of our restaurant where guests can always enjoy the true Italian flavor. As real Italians, we are proud of the quality of our product that we produce on a daily basis, without preservatives and additives. Our chefs cook drawing inspiration from our rich culinary history to always offer the true traditional Italian recipes.